In this month’s Poetry in the Brew spotlight: Feature Katovski and guest host James C. Floyd. 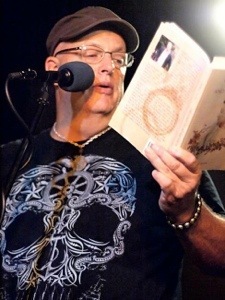 Writer, author, poet and spoken word artist Katovski brings words to life in the breath of which they flow from his lips. Young and old alike enjoy not just listening but feeling his words come off the page and into their hearts. Katovski will be performing Pando, a piece from his book Punctuating Life. Pando is about reconnecting with life via the second oldest living organism on earth a grove of trees called Pando. James C. Floyd is a veteran poet on the Nashville spoken and written word scene, as well as a screenwriter, storyteller, and photographer.